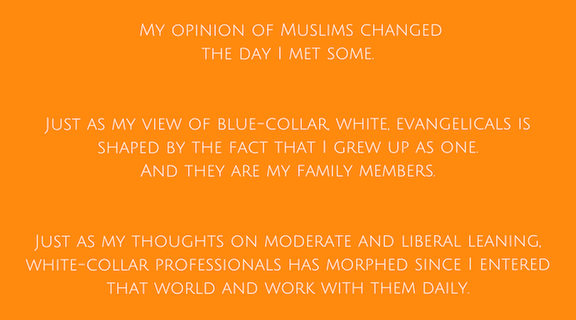 My opinion of Muslims changed the day I met some. Just as my view of blue-collar, white, evangelicals is shaped by the fact that I grew up as one. And they are my family members. Just as my thoughts on moderate and liberal leaning, white-collar professionals has morphed since I entered that world. Because of this, none of these groups is simply a number or a headline to me. Because they have faces. And names. Our relationship no longer makes it possible for me to simply see them as the “other.” Because I know them. I’ve worked with some of them. They’re my friends. In many cases I know their hopes and dreams. And their fears. I know their family members. They are good people. People I respect. ALL OF THEM. Which is why the last few weeks and months break my heart. Because I so want Denny to know Haki. And Haki to know Denny. And for Steve to meet Rich. I want them to see in each other what I see. To get to know—really know—each other. To learn about their hobbies and families. To talk about their hopes, dreams and even fears. I realize we also have differences. And disagreements. Boy, do we have disagreements. But does that mean we have an excuse to not make an effort? To not try and learn about each other’s lives and beliefs? Tolerance means asking yourself, Can I tolerate my own discomfort long enough to engage with you across our differences? And can you, in turn, tolerate your own discomfort long enough to stay here in conversation with me across our differences? This simply requires taking the time to create space in which we intentionally engage one another. And build real relationships. I don’t have to take your view. You don’t have to take mine. But yes, we can have a discussion. And learn from one another. Full disclosure: I certainly don’t do this perfectly. Or even close to it. Just ask my family. I get angry. And sometimes just can’t understand how someone believes something that seems so clearly out of line with my own convictions. I can only imagine what our country and our world would look like right now if we simply tried. The white-collar operations manager we see every day. Or the blue-collar farmer who sells produce at the farmer’s market. Or the Muslim mom who brings her son to school every morning. Or the conservative Christian parent in your child’s play group. What would happen if we all approached one another as curious learners—and not as people to fear or disdain or judge or look down upon? If we did, I would dare to imagine that Denny might not fear Haki’s religion so much anymore. And Susan might see that Marian isn’t actually racist. And Marian would see that Susan, like her, loves her family and just wants the best for future generations. We still might not agree with each other on a whole host of things, and that’s OK. But what we can do is start to see each other as real people. And likely as really good people. So that when we get up in the morning and check the news or our Facebook feeds, we can begin to see and understand each group a bit differently. Because we now see the faces and names that go with them. I hope this happens for you too. I write this blog today because I’m hoping that somehow we’ll all find a way to move forward together as a nation. Because when it comes down to it, we’re all in this together. Christian. Muslim. Blue collar. White collar. Conservative. Liberal. We all want the best for our futures. And I believe we’ll do a much better job achieving that if we can just roll up our sleeves together and do our part to make this a better world—for all of us. Has spending time with someone outside your “normal” circle of friends enriched your life in any way? Changed your views in any way?